It is about as good as a YouTube channel could hope. Fieldsports Channel is the biggest and most trusted hunting and shooting sports YouTube channel in the world. That’s the conclusion of the advertising industry standard SlateScore, which ranks YouTube channels on engagement, consistency, momentum and influence. 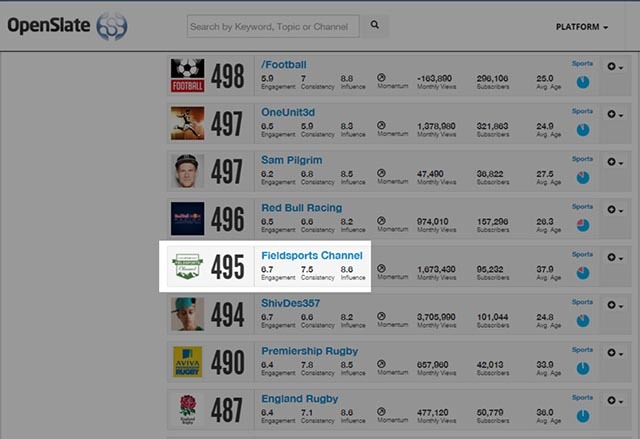 In addition, Fieldsports Channel remains in the Top 40 of all UK sports channels, currently at number 35 on SlateScore, above brands including the England & Wales Cricket Board, golf’s European Tour and England Rugby. Fieldsports Channel has a SlateScore of 495. Used by advertisers worldwide, SlateScore ranks the value of video content. A channel’s SlateScore is calculated using data from YouTube, social media networks and other distributors. Data about how well a channel engages and builds their audience is ingested daily and analyzed over time. The score is on a scale of 1 – 1000 with higher being better. The average SlateScore is typically just below 300. SlateScore measures more than 220,000 channels that are of interest to advertisers. With YouTube now the most popular hunting and shooting media in the world – with a bigger audience than all the hunting cable TV channels and hunting magazines put together – SlateScore includes channels used by advertisers across the international gun and tackle trades. The biggest channels are the American gun channels, with Hickok45 in the number 1 slot (SlateScore 629), DemolitionRanch just behind at number 2 (SlateScore 628), and TWANGnBANG number 3 (SlateScore 529). Even in the pure gun market, Fieldsports Channel takes a creditable seventh place. In other markets, retailer Evike.com Airsoft (SlateScore 572) currently leads a tight pack of airsoft channels, 1Rod1ReelFishing (SlateScore 530) is the top fishing channel and Replica Airguns (SlateScore 521) is top airgun channel. That puts Fieldsports Channel as YouTube’s second biggest airgun channel and fifth biggest angling channel (behind Andrew Flair Outdoors, FishingEZ and Kanalgratisdotse). It is a YouTube channel with 1.5 million views a month (47% bigger than its nearest competitor). Its Google Ad Networks remarketing list tops 8.4 million. It also achieves 3 million views a month in China via Youku (not recorded by SlateScore).